It took forever, but The Monster Squad, the sincere comedy-horror homage to classic movie monsters, is finally out on DVD in a special, 2-disc, 20th Anniversary edition. Dread Central has a Comic-Con video feature on the DVD release, and here’s a very enthusiastic fansite about the film. Kids today might snicker at the 80’s disco hairdos and expressions (“Bogus!”), but the movie has a BIG heart and it’ll win anyone over. 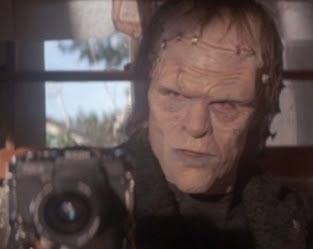 After all, it’s got Dracula, the Mummy, the Wolf Man, the Gill man, and Tom Noonan as the good-guy Frankenstein Monster! Speaking of Noonan, here’s a real treat from the DVD’s bonus features, via Shock Till You Drop, of the actor interviewed in makeup and in character. Check out A Conversation With Frankenstein. Tom Noonan did the best job since Karloff, as play The Monster. I still cry at the end of the movie.